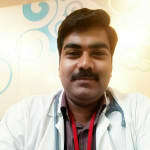 Dr vineesh is a General medicine physician for the past ten years. He specialises with a Holistic approach incorporating a wide range of health problems. He practices focusing on preventive health check ups, chronic health conditions like diabetes, Hypertension, Hypothyroidism, Dyslipidemia, and Men's personal health problems, and other lifestyle related diseases.